Various aircraft accessories & kits. BRL144032: PE fret & instructions. BRL144033: PE fret & instructions. BRL144035: PE fret & instructions. BRL144036: PE fret & instructions. 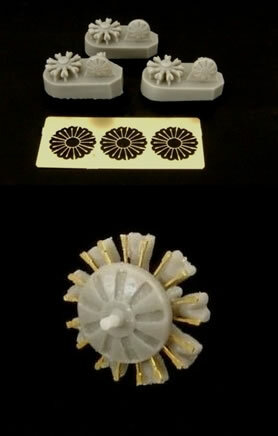 BRL144039: 9 resin parts & 3 sets of PE push-rods. BRL144040: PE fret & instructions. BRS144012: 12 resin and 12 PE parts. Very good quality production, the accessory sets will add considerable finesse to their intended kits, whilst the two kits are little gems. No assembly jig for the B-29 props. Very well produced detail accessories and kits. You will need good eyesight and very, very steady hands. In fact you will probably need to build the Hunter flaps between heartbeats! Definitely recommended in all cases. The accessory sets and kits reviewed here each come in a cellophane bag stapled to a card header, except the P.25 Fire Engine which has a box. The simpler sets are without instructions, whereas the others have them. I have used Brengun’s own images from their web-site as I would not be able to improve on them, and several illustrate the parts in place on their intended kits which is often more informative than an image of a PE fret alone. In each case the PE and resin items are produced to very high standards and offer levels of finesse unachievable in this scale by injection moulding. 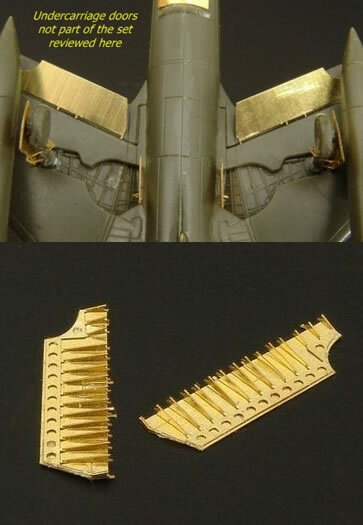 BRL144032 - Hunter Flaps and Air-Brake (for Revell kit): Very convincing if you have the skill to assemble them! 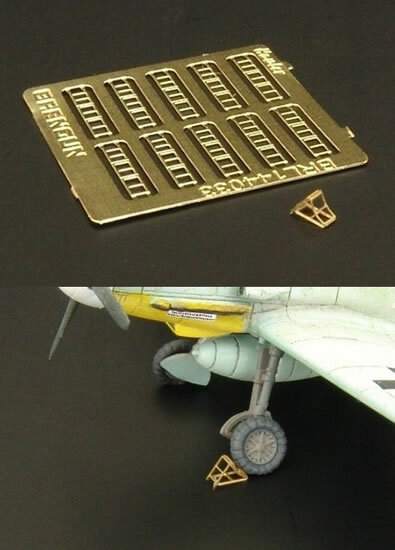 BRL144033 - Luftwaffe Wheel Chocks: Five pairs of very dainty chocks to add interest to any 1/144 Luftwaffe vignette or diorama. BRL144035 - AV-8B Harrier II Plus (for Revell kit): A fairly comprehensive set consisting of cockpit enhancements including tub, seat-belts, instrument panel & HUD, pitot & wind vane, chaff/flare dispensers, drop-tank and missile fins, hot exhaust shields and undercarriage detail. 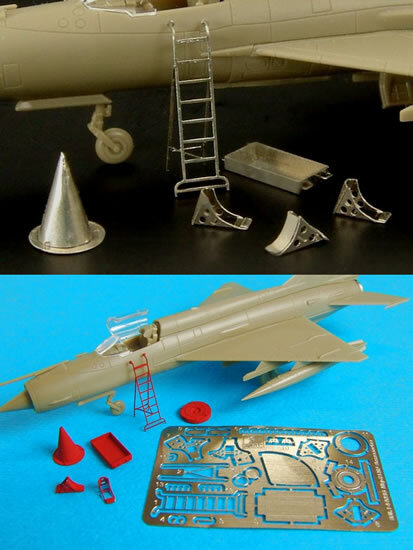 BRL144036 - MiG-21 Maintenance Accessories: Boarding ladder, intake and exhaust covers, wheel chocks and large drain tray. 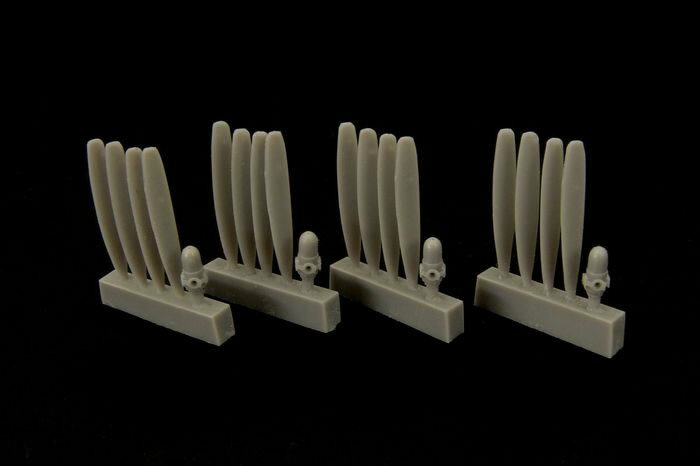 BRL144037 - Propellers for B-29 Superfortress: 16 resin blades and 4 hubs. Care will be needed fixing these at the right pitch and 90 degrees to each other. It’s a pity no resin assembly jig is included. However they should still be a big improvement over kit injected items and would also compliment Brengun’s replacement resin B-29 Engines (BRL144026). BRL144039 - Engine BMW 132 (Not stated but presumably for Eduard’s Ju 52 kit): Very finely detailed and convincing with separate PE pushrods. BRL144040 - MiG-21 MF/MFN (foe Eduard kits): Three choices of instrument panel and cockpit sidewalls, seat-belts, undercarriage doors, wing fences, exhaust ring, missile fins, various antennae and pitot blades. 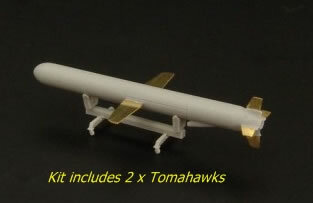 BRS144012: BMG-109 Tomahawk: Should be titled BGM-109; two Tomahawk kits and their transport dollies are provided. 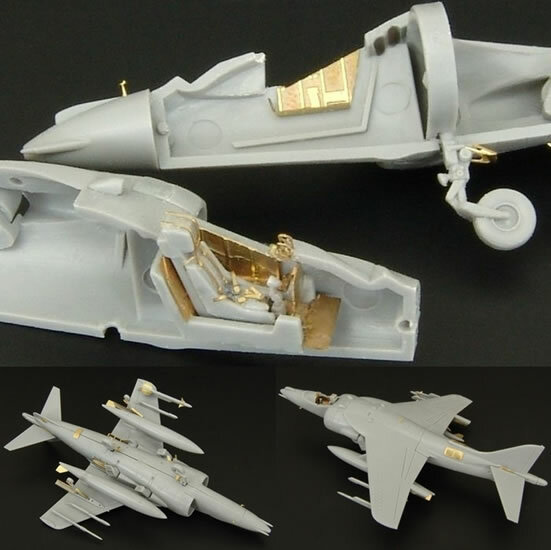 The fuselages and dollies are resin and the missiles wings add fins are PE. This is a simple and relatively undemanding kit No decals or painting guide provided. 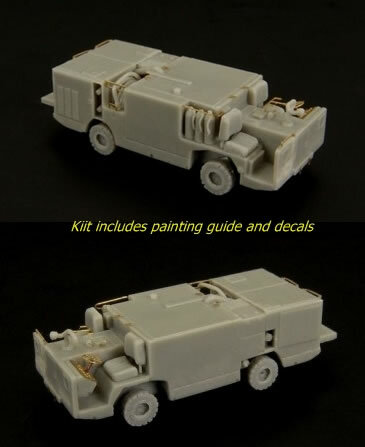 BRS144014:P-25 Fire Engine: This is a very dainty kit with high levels of detail for the scale. Fitting some of the PE parts will be a challenge because of the very fine nature of many parts and their small size, but the results should be quite stunning (about 12 of the PE parts are tiny towing shackles, of which most seem to be spares to replenish losses to the carpet monster!) The instructions provide extensive colour call-outs as well as guiding decal placement. The resin for both kits parts appear faultless, and the PE is also to a high standard. As the accompanying images from Brengun’s website attest, these kits build into impressive little models. 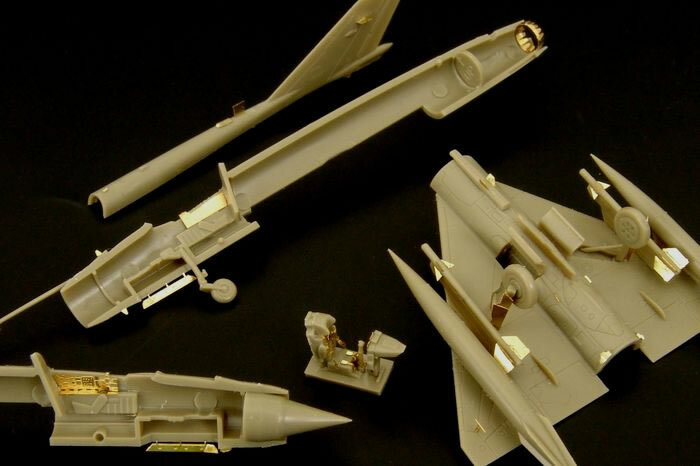 These are very well produced accessories and kits that are sure to appeal to 1/144-scale aircraft and diorama builders. I have to say that as a dedicated 1/72-scale builder that I’m impressed with the level of refinement Brengun has made possible in such a small scale. All of the items reviewed here are highly recommended.